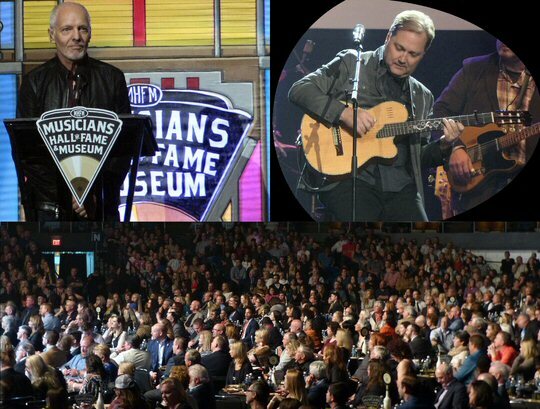 The fifth incarnation of the Musicians Hall of Fame and Museum (MHOF) Induction Ceremony took place on October 26, 2016 at the Nashville Municipal Auditorium and a who’s who of Music City’s musical nobility were on hand to witness a high-flying night of music history. 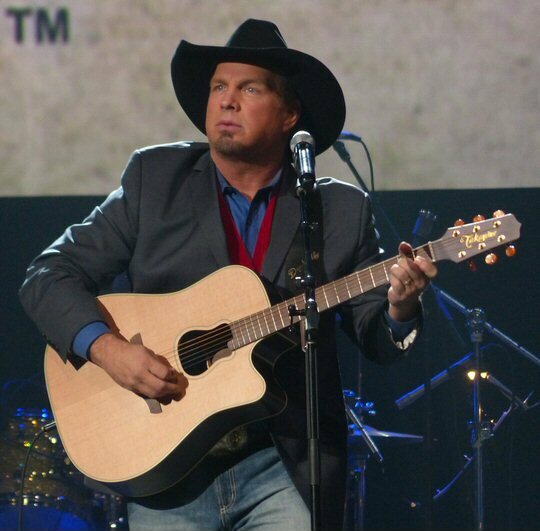 Inductees Garth Brooks & The G-Men played to an enthusiastic reception. 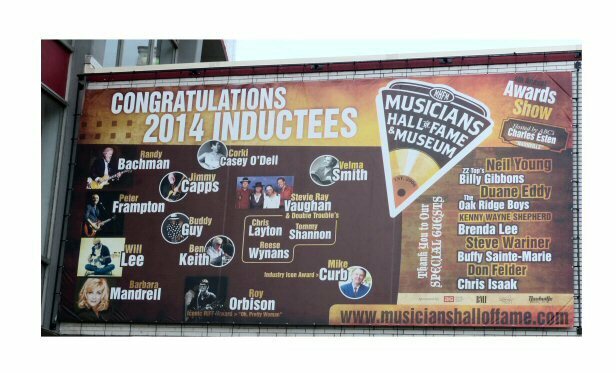 The MHOF first opened on June 6, 2006 to honor all musicians regardless of genre or instrument. While the Hall is populated by many well-known artists part of the mission statement of the organization is to showcase some of the lesser known talent and sideman who were responsible for creating the greatest songs in the library of recorded music. The MHOF has gained momentum and respect in the decade since its arrival on the scene but still has found itself overshadowed by some of the more popular attractions in Music City such as museums for the “Man in Black” Johnny Cash and the hallowed shrine for Country Music on Demonbreun Street. Similarly, the long-standing building that houses the collection – once the pride of downtown – has taken a back seat to the newer and shinier Bridgestone Arena. But, all that is set to change. The vintage venue that has hosted in its time the likes of Elvis Presley, Michael Jackson, Ray Charles, Elton John, Otis Redding, the Beach Boys, James Brown and Led Zeppelin has been added to a list of local historical sites meaning it has dodged the wrecking ball. Don Felder seemed happy as he humbly accepted the honor in Nashville. The Museum has recently undergone a major expansion as a result of a million-dollar partnership with the Grammy Museum in Los Angeles. Now, the Musicians Hall of Fame has opened the new Grammy Gallery, a digital, interactive experience aimed especially at young people – complete with high-caliber karaoke. The amazing night of eclectic entertainment kicked off promptly at 7 p.m. when the talented house band got things rolling with a rollicking romp through an upbeat R&B infused introduction. The two of the evening’s honored guests – Don Felder and Ricky Skaggs – were joined by Gordon Kennedy and Steve Wariner for a buoyant run through of the Eagles “Seven Bridges Road”. “I can’t tell you how honored I am to play on this show with all these incredible musicians, it’s just a dream of a lifetime come true,” said Don “Fingers” Felder the popular guitarist who added muscle to the Eagles laid back tracks when he joined them in the mid-70’s. He was the recipient of the “Iconic Riff” Award and he showed off his deserving six-string prowess on the next number “Victim Of Love” that helped get the three and a half hour show off to a soaring start. 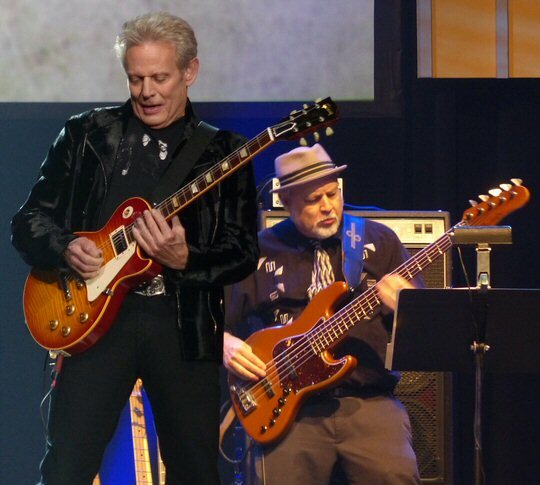 Felder would be later joined by fellow Hall member Peter Frampton as they traded licks on “Hotel California”. Melinda Doolittle and inductee Ricky Skaggs. Soon, the spotlight found the evening’s host Kenny G in the middle of the floor playing a signature song on his soprano saxophone that climaxed on a ridiculously long note as he made his way to the stage. Once there he revealed that he has been playing the same instrument since high school. Next up, inductee Ricky Skaggs was introduced via a short film that traced his career from a young prodigious bluegrass picker to his work with Keith Whitley, Linda Rondstadt amd Emmylou Harris. 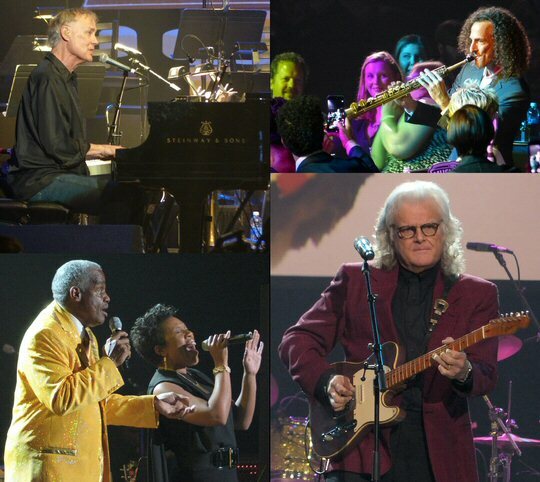 Skaggs then lit things up with his own band Kentucky Thunder and was joined onstage by keyboard player extraordinaire Bruce Hornsby on a run through his hit, “The Way It Is”. 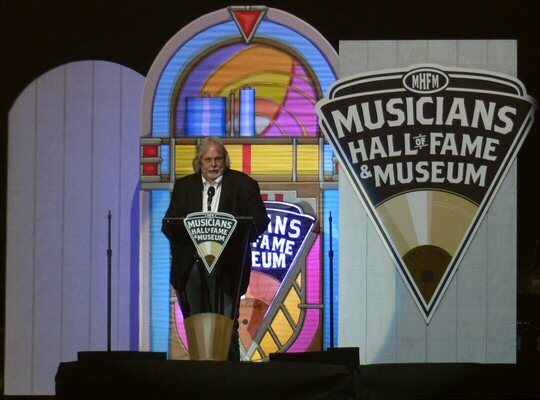 Over the course of its life the MHOF has honored specific groups of players who have created commercially successfully sounds such as The Funk Brothers, The Nashville A-Team, The Wrecking Crew, The Muscle Shoals Rhythm Section & Friends and more. With the 2016 induction of the Sigma Sound Studio Rhythm Section hailing from Philadelphia it was said from the stage that the museum has now officially honored every important group of this kind who have had impacted the world of recorded music. Peter Frampton, Steve Wariner and the VIP tables on the floor. Also recognized at the ceremony was legendary influential guitar player Jerry Reed who received his honor posthumously. Filling in for him was acclaimed six-stringer Steve Wariner who captured the thrill and exuberance of Reed’s unique playing style. Prior to the concert The Musicians Hall of Fame and Museum Director Joe Chambers emceed a medallion ceremony where each of the evening’s inductees received a gold medallion and athletic style jacket emblazoned with their name. Sighted in the crowd were some of Nashville’s musical elite including Garry Tallent of the E Street Band, Dan Auerbach of The Black Keys and Doobie Brother John McFee. The MHOF takes note of the men behind the board, too, having recognized top producers in the past with Allen Reynolds getting the award this time around. This year the Museum opened its doors for the first time to the previously unsung engineers enshrining four of the best this go around to make up for lost time. Lou Bradley, Mark Miller, Ron “Snake” Reynolds and Joe Tarsia made up the inaugural class in this new iconic category. The Musicians Hall of Fame and Museum Director – Joe Chambers. The emotional high point of the night came when Garth Brooks and his longtime studio band known as the G-Men took the stage for their moment in the spotlight. The large group accepted their awards while all paid tribute to their fallen brother, bassist Mike Chapman – who passed away earlier in the year after a tough battle with an aggressive form of cancer. Garth and the G-Men received the loudest ovations of the night during their thrilling three song set that included the rockin’ “Thunder Rolls” and the fan favorite known as “The Dance” which was particularly appropriate on this occasion. The Motown classic “Love Train” reprised the opener to close out the solid night of entertainment in Music City. As Nashville continues to grow in its current status as the “It City” people from all over the world will continue to flock to the little big town on the banks of the Cumberland River. The staff at the MHOF will be glad to have you visit as they invite you to “Come See What You’ve Heard” in their hallowed hall. 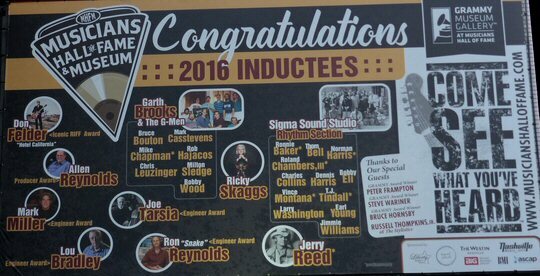 The Musicians Hall of Fame and Museum welcomes the Class of 2016.